Joe Shuster, the comic strip artist who created Superman, was Canadian and his early drawings of Metropolis were fashioned after the buildings and skyline of Toronto, his hometown. In 1923 Shuster's family moved to Cleveland, Ohio, where he met Jerry Siegel, the man who became Superman's writer. The two were only 17 years old when they created Superman in 1933. 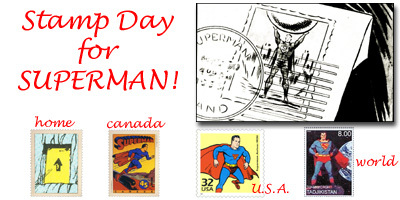 Canada Post's set of stamps captures the essence of Superman and other Canadian comic book heroes by using colors reminiscent of the early comic books, copying the comic's original typeface for the names, and enclosing the 45-cent stamp denomination in a circle as if it were the price of the comic book. Issued only in booklet form, the stamps are perforated on all four sides. The booklet's cover repeats the image of the Superman stamp, while on the inside, the selvage offers cameos of each character and ten 45-cent stamps. Even the booklet is super sized. Measuring four by six inches, it is the largest stamp booklet ever produced in Canada. the booklet Canada Post issued official first day covers with only one format: a strip of three stamps and a pair below -- one of each of the comic book heroes -- datestamped with comic book style lettering for the cancellation. Canada Post also offered a set of five post cards, each picturing one of the stamps. One side is an exact enlarged image of the stamp, so philatelically it is called a "maximum card." The stamps and post cards were only available from Canada Post through April, 1996.